In every child delivery the truth remains that blood and water must be involved, nevertheless the birth must take place despite the pains and in the end jubilation and merriment follows because the anticipated result has been achieved. For any nation to be free and independent either from colonial country or host nation, a lot of things are always being involved, sometimes it may involve peaceful process and in other way round it may involve violence but the soul aim of the agitators will be nothing but to gain their freedom by all means. There are many countries of the world that got their independent perhaps their freedom from the colonial masters or host nation with the use of violence agitation while some got theirs with the use of peaceful processes, many Africa nations got their independent with the use of violence agitation such as war, protest civil disobedience because that is the best language they seems to understand, but some nations in the Western world got theirs with the use of peaceful processes while some got with violence. Freedom is freedom irrespective of the means through which it was achieved, what matters is that you were able to get what you're fighting for no matter how long and what it will cost you. According to the leader of the Indigenous People of Biafra (IPOB) Mazi Nnamdi Kanu, he said "Freedom is not given rather it is taken" and I totally concur with him, moreover whenever you want to 'take' something you apply more wisdom, knowledge, time and strength because a lot are involved unlike what will be given to you at ease; why you ought to apply more level of doggedness in trying to get something is because many go for that same things due to its relevance and it will be possessed by the men of valour who are prepared to pay the sacrifices therein. In Nigeria there has being series of agitation for self-determination and self-rule since 1960s when the British that colonised the contraption exited the seat of power to their Hausa Fulani cohorts. 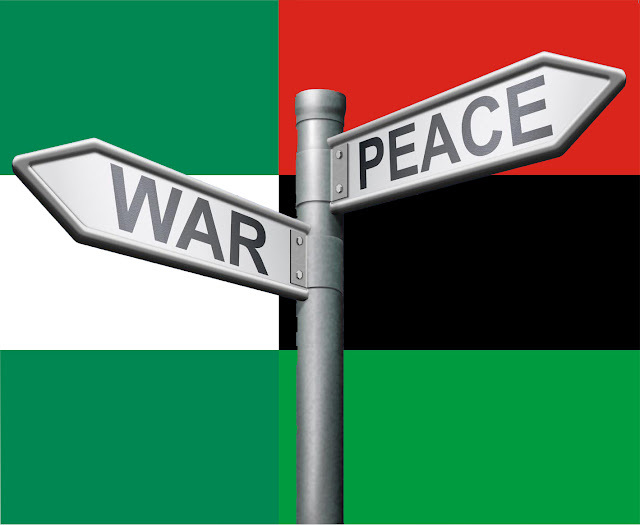 Biafra was the first to agitate for freedom from the colonial contraption known as Nigeria in 1966 due to high level of marginalization, maiming and killing of the Igbos (Biafrans) in other parts of Nigeria especially in the North, this led to the bloody civil war in 1967 that claimed not less than 3.5 million lives of Biafra people recording women and children as the most victims. Partial paper peace returned after the war in 1970 following the 'no victor no vanquished' declaration by the then Nigeria head of state who led the genocidal war against Biafrans Gen. Yakubu Gowon. Nigerians have never been in the state of one accord and mutual relationship ever since the war ended irrespective of what they say and write in papers that Nigeria is one, the war brought perpetual enmity between the four main tribes in Nigeria: Hausa, Fulani, Igbo and Yoruba. The leadership of Nigeria was being highjacked by the Hausa Fulani giving the remaining vacant to the Yoruba while the Igbo (Biafra) have no place in the leadership of Nigeria for many years, which left the entire region in the state of economical, infrastructural, social decay. A lot of effort has been made to address this matter but to no avail and the only option left for Biafrans is to agitate for the total freedom and restoration of Biafra which is truly their own, this new era of agitation for Biafra freedom from the evil contraption called Nigeria have taken so many processes starting from 2000 when Ralph Uwazurike who use MASSAB to betray Biafrans as a result of the struggle, many lost their job, families and even life in the struggle. Mazi Nnamdi Kanu off course is a man whom Chukwu-Okike-Abiama sent to come and finally liberate Biafra from Nigeria the evil host nation, he formed and registered Indigenous people of Biafra (IPOB) worldwide, Radio Biafra, and Biafra television, Biafra times newspaper, the group and the media have worked so hard in communicating to the world the plight of Biafrans, engaged in so many peaceful agitation processes as permitted by the United Nations chatter on the right of the indigenous peoples all over the world. The most worrisome is the fact that none of this peaceful process of agitation seems to be making much positive change or even draw the attention of the UN, EU, AU and other international organization to the afflictions of Biafra people as to do the needful. It is often said that a wise man does not put his egg in one basket should it peradventure fall, a lot of work still need to be done in the struggle to restore Biafra under the umbrella of IPOB headed by Mazi Nnamdi Kanu though the number of days to do this is limited, a good planner must always have and prepare for plan A and B in case one fail to yield the needed result then the second option will be used. The language of peace has being used in the form of peaceful agitation in the struggle to restore Biafra over the years but it seems the more peaceful we become the more violent our oppressors becomes, hence the need to stand up and face what is facing us as to possess our possession because from the days of John the Baptist, the kingdom of God suffers violent and the sons of violent takes it by force, there is a great need for every Biafrans wherever you are to prepare for either peace or war, because a cripple doesn't fall a victim of prepared and announced battle.